Protagonist Natuk rescues an abandoned bear cub. Young “Eskimo” Natuk lives in the far north. One day, she spies an abandoned cub on the ice and takes him home to her igloo. White Bear quickly grows, and the two are inseparable, playing on glaciers and teasing penguins. After the village’s supply of fish is raided, White Bear is blamed and told he must leave. However, Natuk decides to find him but becomes caught in a blizzard, to be saved by White Bear. The villagers find them and welcome White Bear back because they now realize he didn’t destroy their food and can help drive off the wolves who did. 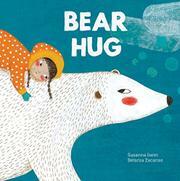 Zacarias’ illustrations are pleasant, done in frosty blues and whites, White Bear’s and Natuk’s cheeks both glowing a cheery pink. But the book presents problems. Igloos have never been permanent homes but are temporary shelters for hunters, so a village of igloos is unlikely. Penguins live only in the Southern Hemisphere and not in the far north. A child Natuk’s age would not live alone in a traditional village, as she seems to do here. The word “Eskimo” is not an Indigenous word and does not recognize the diverse groups of traditional peoples of the north.